These days, Crystal Giles negotiates dinner options for her two kids alone. There’s Talon, her four-year-old son, and Riley, her eight-year-old daughter. Giles moves a plate of burritos out of the microwave for Talon, and eventually settles on pizza rolls for Riley. “That is way too many pizza rolls, little girl,” Giles tells her as Riley pours them out of a bag from the freezer. She laughs and puts some of the rolls back in the bag. The moment is light, even though it’s tinged with the thought that her dad isn’t around to share a plate full of pizza rolls with her anymore, not since he took his life on November 7, 2018. Officer Jonathan Giles was one of 12 law enforcement officers in California who took their lives last year. In total, 159 officers died by suicide in the U.S., which is more than the number who died from assault, gunfire, car crashes, and even job-related illnesses combined. That’s according to Blue H.E.L.P, a support organization for law enforcement families. Jonathan Giles’s wife, Crystal Giles, says the stigma surrounding mental health and a fear of losing his badge made her husband reluctant to get help. “It just all became way too much for him to bear. And I can’t blame him, because I know what it’s like to be on that side of the fence,” says Giles. She knows what it’s like because she tried to take her own life nearly four years ago. She knew she should seek help, but it wasn’t until Giles was at her breaking point and about to take a bottle of pills that she called her husband. She says he was there for her the whole time. “He went to therapy sessions after therapy sessions, psych appointments after psych appointments, he was counting my pills to make sure I took my pills that day,” Giles recalls. Giles says that Jonathan was much more comfortable being the helper than seeking help. He got her through her worst days, but he resisted helping himself. Giles says he wouldn’t get help because he was afraid that he would lose his job, or future opportunities. At the Fresno Police Department, there is someone to help officers feel safe when they go through traumatic incidents on the job, or even just experience stressful life events. His name is Jesus Cerda, and he works with the employee services unit for Fresno Police. The idea, Cerda says, is to help them process the experience so they can start to move forward. He’s aware of the increased suicide deaths, nationally, and that’s what he’s trying to combat. Cerda says that it can be challenging to get people to open up, though. In the end, Cerda says, they don’t want to take anyone’s badge away; they want their officers to be well. It’s a strategy that he says is becoming more popular, but not every department is ready and some don’t have the resources to adopt it. Case in point: Jonathan Giles was an officer with the city of Lemoore, which is much smaller than Fresno’s department. The Lemoore Police Department did not return multiple requests for comment on this story. Crystal Giles says she has not had much contact with the Lemoore Police Department since her husband died. She did invite the department to come in uniform to her son Talon’s birthday party. In the end, uniformed officers from Madera, Chowchilla and Kingsburg came instead — one of them was Cerda, from Fresno. Crystal Giles says that while Jonathan was afraid to speak up, she’s since found resources that support officer mental health and suicide prevention. She wishes she had known about them sooner. What she feels she can change is the perception around mental health and police officers. 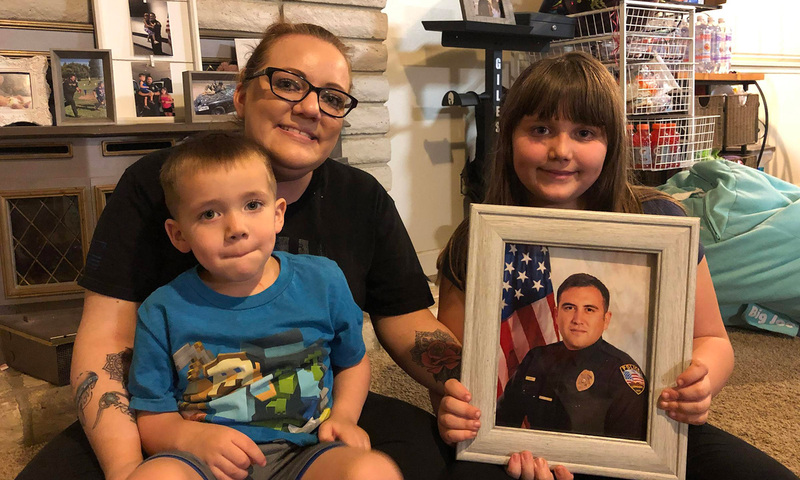 Giles has gotten involved with several organizations that do this work daily, and she just finished a fundraiser in memory of her husband, Officer Jonathan Giles.